haha LOL. I am a hindu. But most hindus are atheists anyway… We believe more in karma (sanskrit for work/action/reaction/result/cause-effect) than in god (small g). You can piss on a hindu idol and most hindus will shrug their shoulders and say if a dog barks at the sun, will it affect the sun? 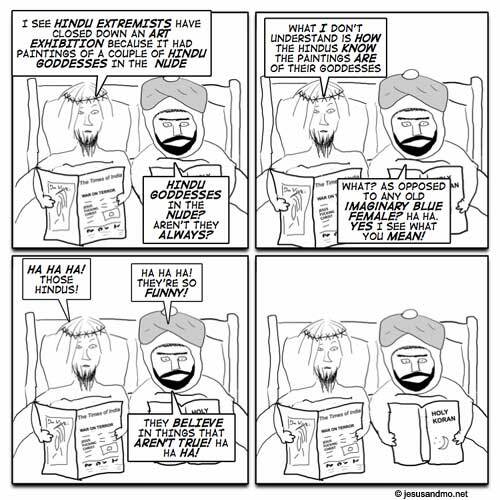 Was it deliberate that Mo’s speech bubble covered up his Koran in the first three panels? dont make fun of hindus, you dirty atheists!